With the tools at our disposal, we’ll never quite be able to get rid of the issues related to scaling, but to somewhat combat this, I’ve come up with a new export scheme. In my previous templates the export actions would slice up each scaled smart object and export each individual slice. 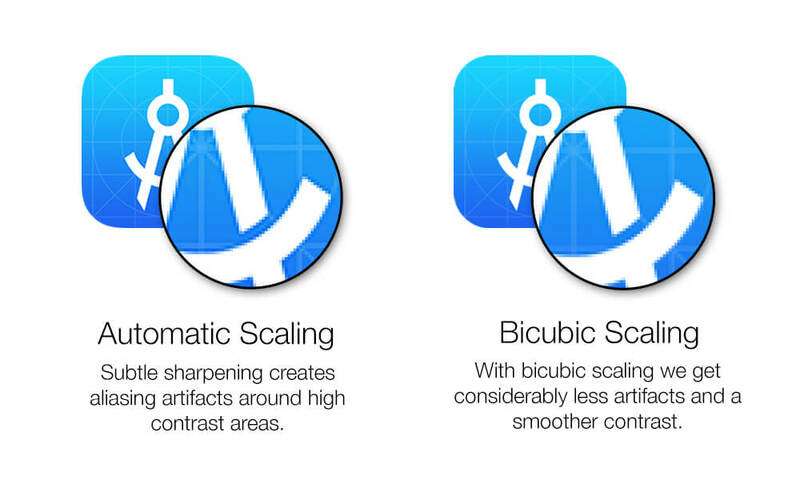 With that method, Photoshop defaults to automatic bicubic scaling. (This is the same thing that happens when you just transform something in Photoshop). The algorithm Photoshop uses when downsizing has sharpening qualities which might work fine if you’re working with pictures, but not when you’re working with hairline contrasts. The result of this automatic scaling is noticeable aliasing issues. Long time users of the App Icon Template will know these issues all too well. Difference between automatic and bicubic rendering of pixels. I first introduced the new bicubic scaling exports in my macOS Desktop Icon Template and now I’m bringing it to the iOS Template. Instead of saving out each of the sliced sizes you see in the template, the new export action will resample the largest icon with a plain bicubic algorithm (with less sharpening qualities). It will do this repeatedly for each size. What this means is that the multiple sizes you’re seeing auto generated via smart objects in the template is just a preview and not part of the actual export. 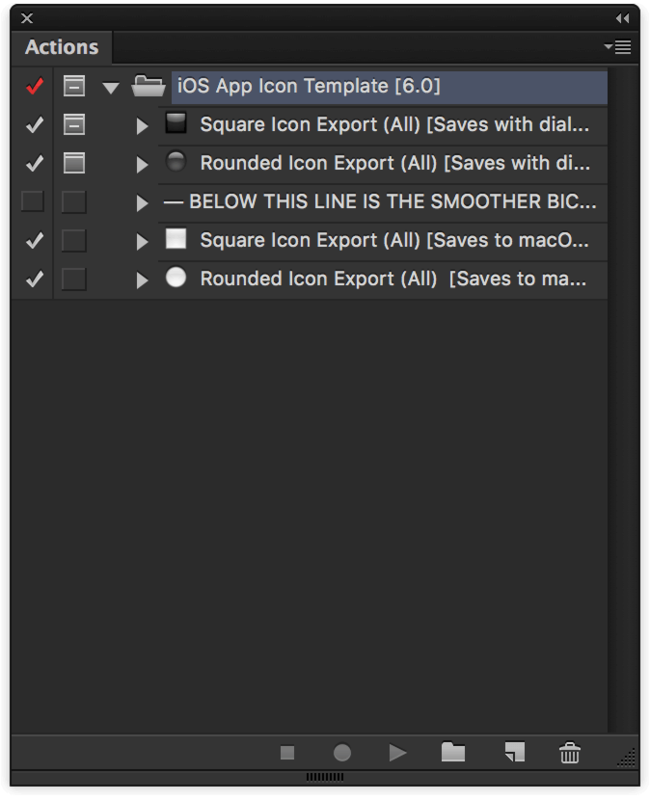 In the iOS icon template you’ll find two separate sets of exports. The regular ones and the bicubic ones. The new export actions currently outputs to the desktop as I haven’t found a way of making the location user selectable yet. They also do not work on most Windows machines. The old legacy slice-based actions are still included, Windows users will have to use these until I figure out a way to make the new ones work on Windows. In short, the new bicubic export actions should produce softer and less aliased PNG files, whereas the old slice-based exports produces the slightly sharpened results we’ve come to know. Use your own best judgement on when to use which.